In China, Tui-Na practitioners treat conditions that, in the West, would be treated by osteopaths, chiropractors and physiotherapists or with drugs. Today it has become very advanced in its treatment for many diseases, used in many hospitals in China, it has become the frontline of healthcare, whereas in the West many problems tend to get treated only at a chronic stage. Chinese Massage in Cornwall, although becoming popular throughout the rest of England, Cornwall has not yet experienced this highly skilled profession – until now! Facilities include: Modern therapy couches, massage / heat chairs, Fresh Hot Clean Towels, Free Refreshments, Comfortable waiting area, Soothing Chinese music, Beautiful, Highly Skilled Chinese Masseurs, Toilets, Gift Shop..
We are located at 16 St.Mary’s Street, Truro, Cornwall, TR1 2AF Next to the Cathedral Offices. Parking at the short stay carpark on St.Clement Street, Use the footbridge over the river, and our entrance is a two minute walk. Or check the Google Map for more directions. 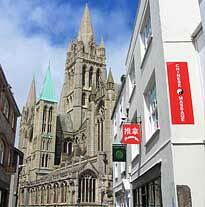 We are set in a beautiful old Georgian building and are two minutes walk from the Cathedral, so why not visit this great monument at the same time or visit one of the many shops that Truro has to offer. We offer a wide range of treatments from traditional chinese massage (Tui-Na) to relaxing Traditional Chinese Foot Massage, Ear Candling and some less well known therapies such as Chinese Cupping Therapy and Infra Red Massage techniques. Massage has many benefits from general relaxation, feeling of well-being, enhancing mood, improving circulation, lowering blood pressure, improving muscle function, improving lymphatic flow, boosting immunity, improving nervous system function, removing acid and other cellular wastes. It also detoxifies the body, relieves pain, enhances flexibility, relieves stress, lubricates joints, and relieves fatigue.